Without context, marketers are left wondering if their results are any good. 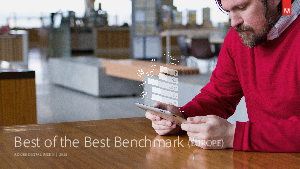 The Best of the Best Benchmark report compares the overall average versus websites in the top 20% on 6 key performance indicators across six regions — United Kingdom, France, Germany, BeNeLux, Nordics and United States. Download this report to see how your online presence measures up against other sites and how overall averages are trending year-over-year.